Crowds of onlookers and all the Fallas Committees gather beneath the Serranos Towers, one of historical Valencia’s best-known monuments, usually on the last Sunday in February. After a spectacular inaugural display of light, sound, music and fireworks, the “Fallera Mayor” of Valencia (elected Festival Queen), surrounded by her Court of Honour and the city authorities, invites everyone to enjoy the imminent fiesta, proclaiming its excellence and virtues. The greatest expression of religious devotion in the whole Fallas Fiesta calendar, with an elegance, grandeur and visual impact that is rarely surpassed. This is what is known as the “Ofrenda de Flores a la Virgen de los Desamparados”, a floral offering to the Kingdom of Valencia’s patron saint, Our Lady of the Forsaken. 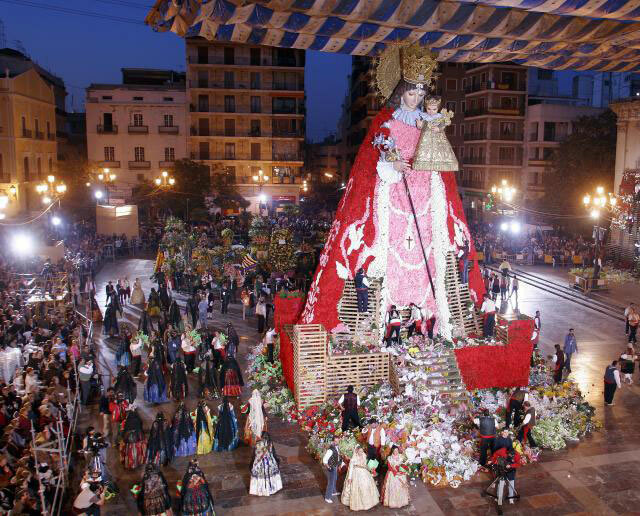 All the Fallas Committees take part in this event, decked out in their finest, to present their bouquets of flowers to the enormous image of the Virgin which stands in the centre of the plaza named after her, overlooked by her Basilica. A parade of thousands upon thousands of “Falleras” and “Falleros” fills the city streets, wearing regional costumes and adding to the visual charm with the colours of the flowers. Each Committee brings its own music band and, in some cases, a spectacular basket with the most original and creative floral decorations. 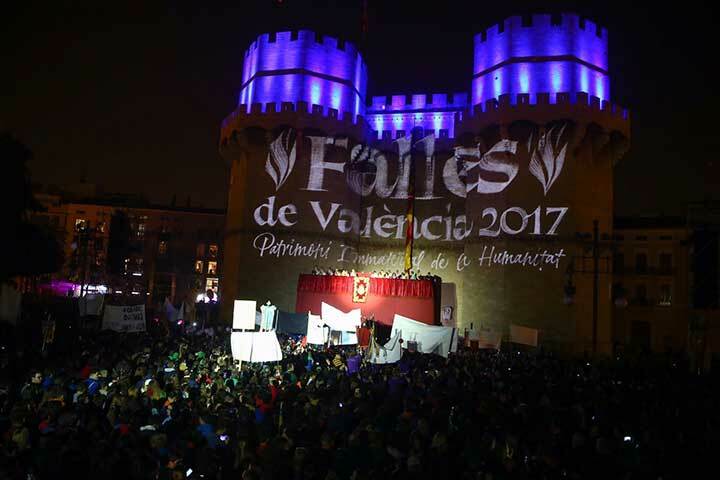 Because of the incredible number of participants, the Offering is held on two days (17th and 18th March) and, for many reasons, it has now become the Fallas week’s central event. 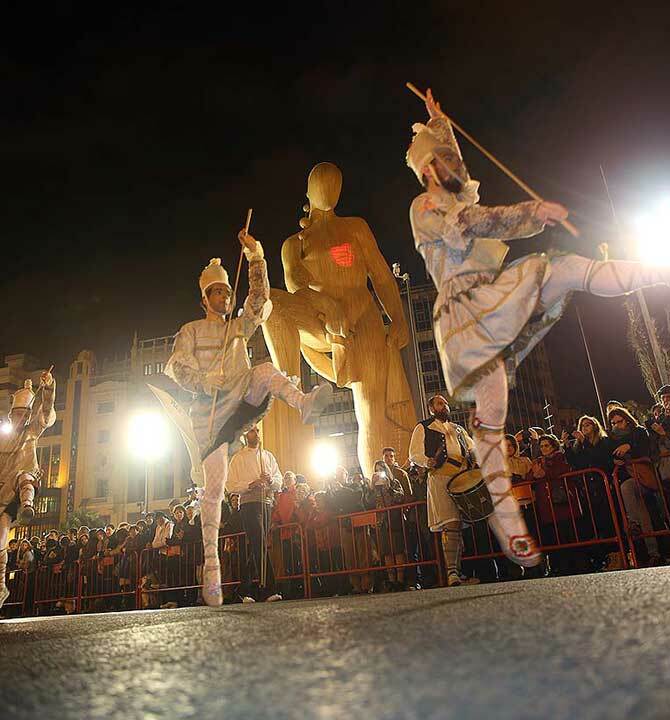 There are several cavalcades in the city centre during the Fallas Fiesta, adding a touch of colour, excitement and visual impact. Each one has its own spirit and presents a different proposition for tourists and locals alike.